The perfect sauce for summer vegetables, stir fry, tofu and chicken. Also excellent on broiled or grilled seafood like shrimp, salmon and tilapia. Shabu Shabu, dumplings and pot stickers come alive with flavor. 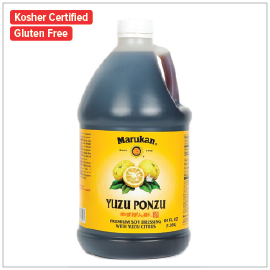 Marukan Yuzu Ponzu delivers a balance of lemon and soy flavors. Yuzu fruit is tart, closely resembling that of the grapefruit, with overtones of mandarin orange. In Japanese cuisine, its aromatic zest (outer rind) is used to garnish dishes and its juice is commonly used as a seasoning. It is an integral ingredient, along with the sudachi and other similar fruits, in the citrus-based ponzu sauce.